We heard from ALL the coaches after the game about the extraordinary job done by our defense to hold UCLA to a couple of short-field scores, but HOW did they do it? Offensive players expressed their gratitude at how our “Green Wall” kept us in the game until they could get things untracked. At FishDuck.com, we have not touched on the specific methods used by our defensive line to capture those tackle-for-losses, or exhilarating QB sacks — until now. Let’s take a look at the techniques that turned the game for the Ducks and against the Bruins – and learn how to spot them in the future! The most important and fundamental component for defensive linemen to learn, is how to disengage the hands of the offensive linemen. The O-line wants to reach out and stop the D-line with their hands, thus, removing the OL’s hands clears the way to the ball carrier. 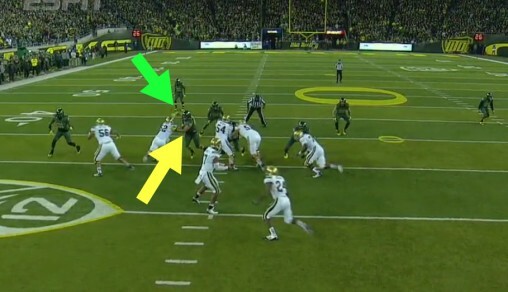 Many of us have heard of the “swim move” as being a staple of defensive line technique, and Taylor Hart (yellow arrow, above) demonstrates beautifully how to carry it out. 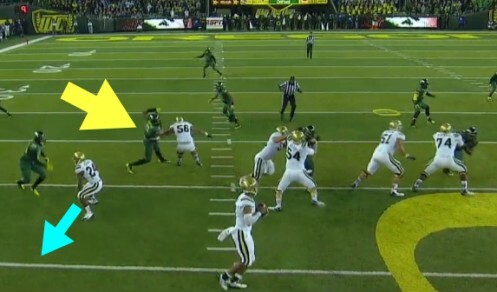 We see him here, beginning the first part of this move by blasting the arms of the freshman Bruin guard with his left arm, thus sweeping the offensive lineman’s arms under him. Taylor has his left arm underneath, as the force of blasting the UCLA guard’s arms pulled them down, but Hart’s right arm is sweeping OVER the guard’s head in a swimming motion (yellow arrow, above). It is quite a specific ‘one-motion’ technique that Coach Aiken teaches. 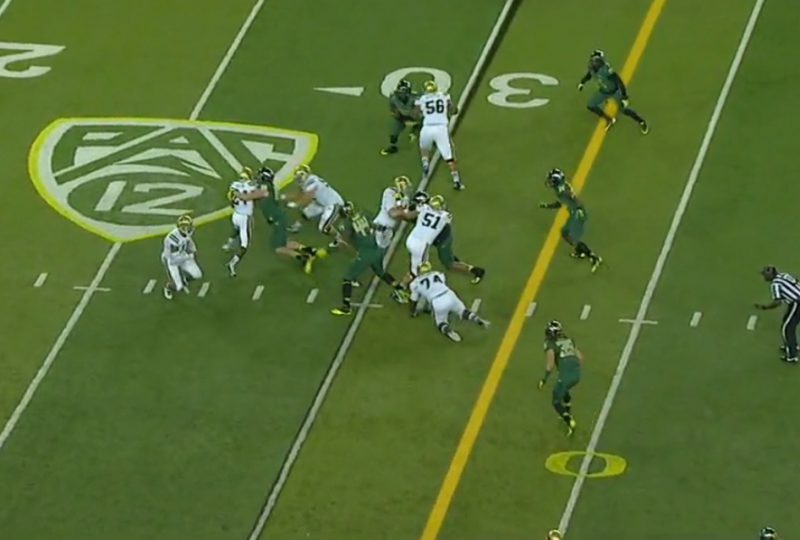 It was very difficult to catch this at the precise instant, because the Oregon defender carried it out so quickly. This screenshot shows the incredible skill that the Tualatin, OR, defender displays. 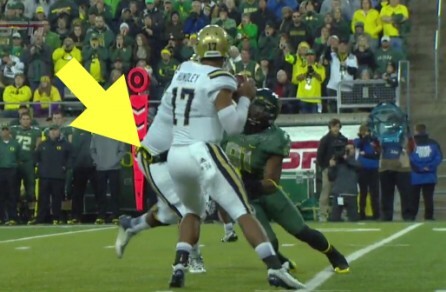 We see (above) the yellow arrow pointing to his left arm that has blasted the UCLA guard’s arms underneath and away, while the green arrow points to his right arm sweeping over the top, in the freestyle-swimming motion. 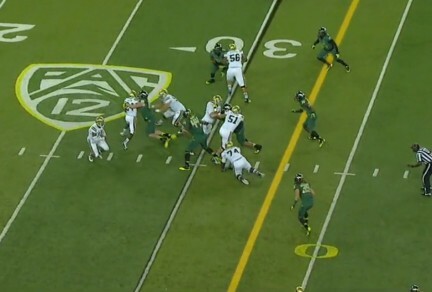 This whole maneuver is done in a blink, and it has resulted in Taylor being unblocked and ready to destroy the play. Hart (above) is just blowing up the play in the backfield for a superb tackle-for-loss, with a swim-move he completed in less than a second! Wow. It is an important third-and-long play for UCLA, and we want to keep an eye on the Bruin RB who is responsible for blocking ‘Bolo,’ (No. 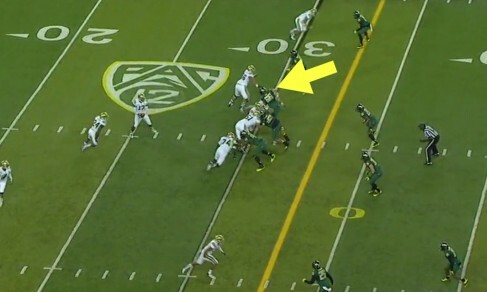 25, above) and also on Arik Armstead (No. 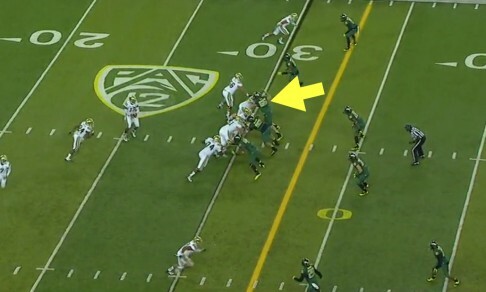 9, yellow arrow), who is positioned on the inside shoulder of the offensive tackle of UCLA. 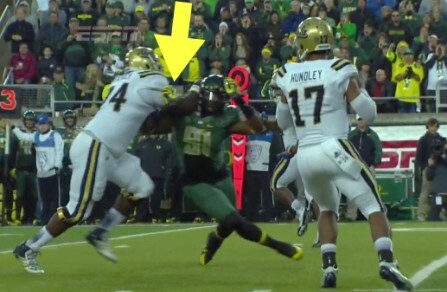 The yellow arrow, above, points to a variation of the swim-move done by Armstead, as his right arm has blasted by the Bruin tackle — notice that Arik’s left arm is “swimming” over the top. He is cleared for takeoff! 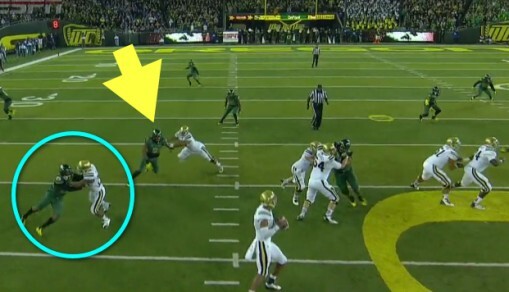 The UCLA running back has come out to meet Bolo, but also wants to beat him to the spot on the outside (light blue arrow, above), so that he can drive the Oregon OLB away from the play and their QB. 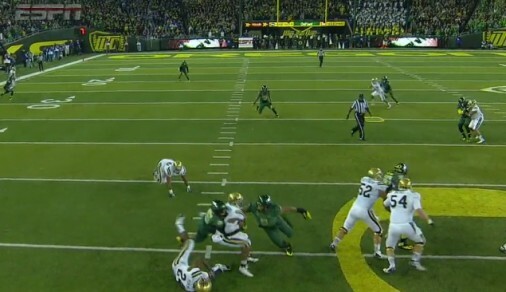 Armstead (yellow arrow, above) is gagging on his drool as he sees an unobstructed path to the QB, while the UCLA tackle is desperately trying to grab him. In the light blue circle, we see Bolo beating the RB to the spot – much like the winner of musical chairs – and in order to make the turn, Big No.9 is beginning to employ the “Rip” move of driving his arms underneath the arms of the Bruin RB, using that leverage to turn the corner with his momentum headed to the QB. 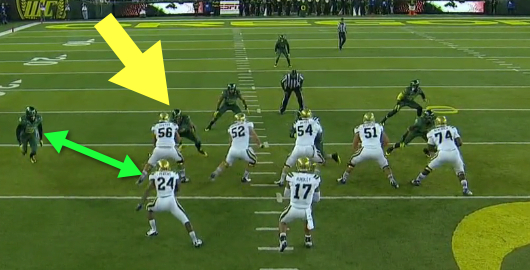 Both Oregon defenders (above) get to Hundley at the same time and gobble him up, while leaving Bruin players in their wakes. How sweet it is! 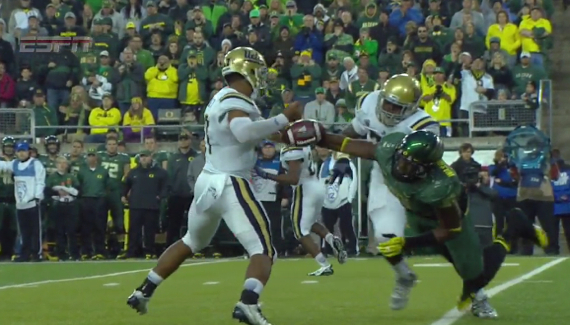 Our final example of tremendous technique shown by Oregon defensive linemen, is also the most difficult to perform. Tony Washington is using his speed to get to the backfield, but often the offensive linemen will use that speed to run him out of the play completely. The way he beats that is with the “Rip” move. 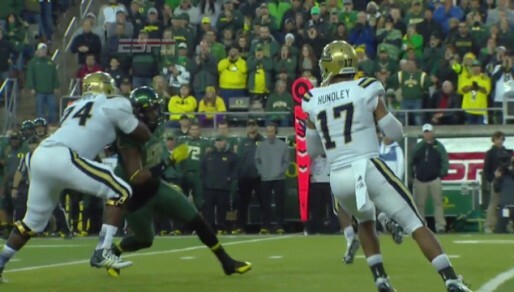 Tony (above) is just beginning to come into the turn, but has positioned his right arm UNDER the arm of the UCLA tackle. The next part of this technique is extremely difficult, as he “rips” his arm upward (yellow arrow, above) to gain leverage going around the corner. Tony maintains his balance, while at a high rate of speed! He is almost free! Even more important is that his ARM is free (yellow arrow, above) and while the offensive tackle is pushing him away — Tony has that free arm to create havoc. 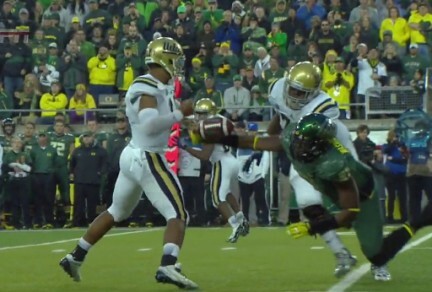 We all recall the result of Washington’s free arm; he uses it (above) to rip the ball out of the UCLA QB’s hand to stop the scoring threat! There have been a number of NFL defensive linemen who have stated that this “Rip Move” is the most difficult maneuver to perform when combined with a speed rush. It requires great balance, timing and athleticism. Not many can do it at the highest levels, and it is thrilling to see Washington shock us with his skills at the Pac-12 level! My feathered friends — we all know of the various coverages and blitzes that Defensive Coordinator Nick Aliotti attacks the conference with, but we are now becoming aware of the impact that Defensive Line Coach Ron Aiken is making on our defenders in the trenches. I once spent a half hour listening to him talk to coaches about the HAND PLACEMENT of defensive linemen! Can you imagine the complexity of it all if you need 30 minutes to explain it? We are fortunate to have all his years of NFL coaching experience at University of Oregon. It has reaped dividends already!